The Pascal is one of the first cameras for roll film, and the first with spring-motorised film advance. It was made in France by Japy Frères & Compagnie, from about 1899. It is a box camera, with a wood-and-metal body, with leather covering. It makes twelve pictures 40×55 mm on special roll film (not Kodak roll film; an interesting commercial choice). The film has paper leaders, but is not backed along the whole length. According to the advertisement, it is for daylight-loading. One of the items offered is a trial roll; a spool of film without emulsion, and with cloth leaders, to practice loading and test the film advance. The camera was designed by Francisque Pascal who patented it in several countries. Most of the functions of the camera are unexceptional. As standard, it has a 69 mm f/12 achromatic lens; in an article reproduced at Collection d'Appareils, the maker offers to make the camera to order with a Zeiss Anastigmat (at a cost of 100 francs, compared to the price of 14.75 francs with the achromat). The shutter is a simple one, with two instantaneous speeds (marked 'R' (rapide) and 'L' (lente), plus 'P' (pose; 'B' shutter). There are three fixed aperture stops; these are selected by pulling up (or pushing down) a metal tab above the lens. The shutter release button is at the top front corner of the right-hand side. Nearby is the front glass of a Newton finder that swivels about one corner to unfold into place. The finder has a catch that engages with the shutter button to lock it when the finder is folded down. The spring motor is wound with a key on the bottom of the camera. The motor advances the film after the shutter is released. There is a frame counter in a window in the top of the camera. Two types were made. In the first, the back and sides are hinged; in the second type, the back and sides slide into place. ↑ 1.0 1.1 Catalogue page for special roll film for the Pascal, by Société Anonyme des Pellicule Françaises, at Collection d'Appareils. ↑ British Patent 201 of 1899 granted to Francisque Pascal and Louis Izerable, describing the Pascal, at Espacenet, the patent search facility of the European Patent Office. The French patent is not apparently in the database. ↑ Révue Illustrée de Photographie, 1900 article: 'Nouveautés Photographiques' describing the Pascal, at Collection d'Appareils. ↑ Pascal (with rigid sliding back) sold at the nineteenth Westlicht Photographica Auction, on 28 May 2011; several excellent pictures. ↑ McKeown, James M. and Joan C. McKeown's Price Guide to Antique and Classic Cameras, 12th Edition, 2005-2006. USA, Centennial Photo Service, 2004. ISBN 0-931838-40-1 (hardcover). ISBN 0-931838-41-X (softcover). p450. 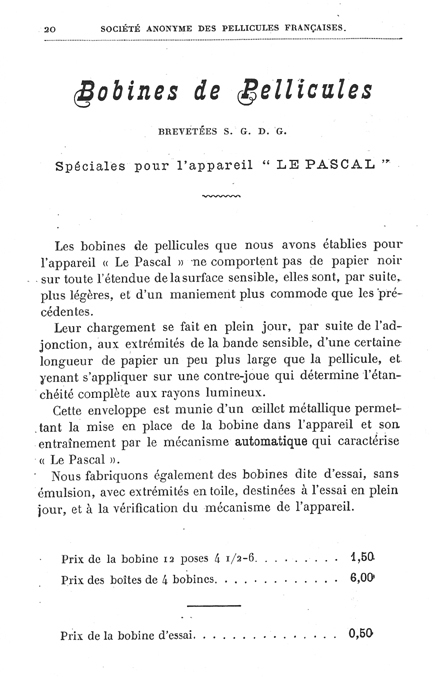 ↑ Le Pascal (first type with hinged back and sides) at Collection d'Appareils. ↑ Le Pascal (second type with sliding removable back), plus pictures of film spools and a leather case for the camera, at Collection d'Appareils. This page was last edited on 3 March 2016, at 02:56.